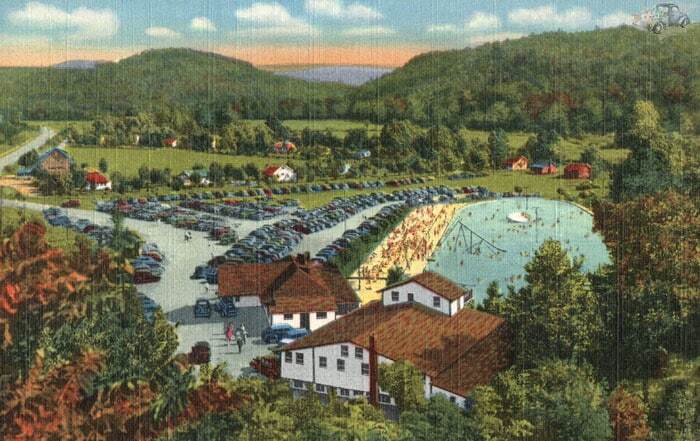 This postcard shows an aerial view of Ligonier Beach in its heyday. Both the giant slide and spinning disk can be see in the image. Fifty years ago, large, public swimming pools were common. They could often be found paired with amusement parks and even drive-ins. Over the years, these pools began closing, each one disappearing into memories. 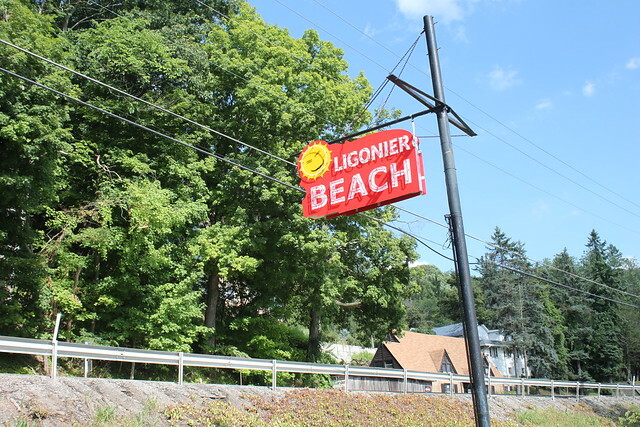 Ligonier Beach, which was a local staple, managed to survive for 93 years before closing forever last year. It always seems that I say “we need to visit that next year” only to find out there there never will be a next year. This was what happened last spring when I told my husband that we needed to go to Ligonier Beach that summer. However, before the season even began, major flooding struck the area. Even before the flooding, Ligonier Beach was struggling. The owners were filing for bankruptcy, so when the flooding took out the pool’s two pump houses and a furnace it was disastrous. 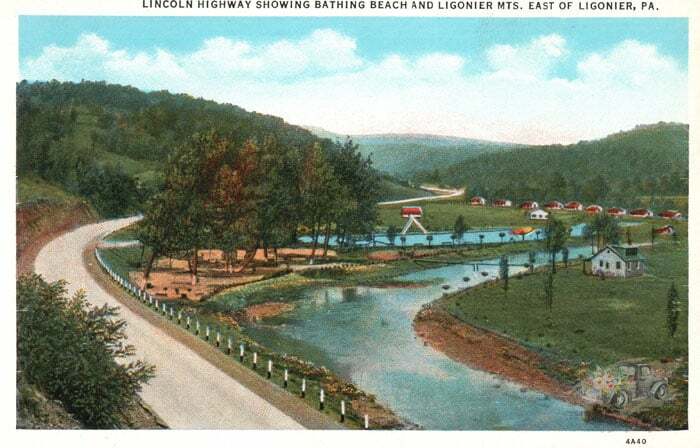 An early view of Ligonier Valley Bathing Beach. Note that you can see the pool’s giant slide, spinning disk, and bathhouse. Tourist cabins can be seen in the background. A closeup view of the iconic spinning disk located in Ligonier Beach pool. A memory that many people have of the pool is the cold water. This is because an aquifer was used to fill the pool. Other memories that people have of the pool are the high dive, spraying fountain, wooden spinning wheel, and jumping board. The fountain and jumping board remained at the pool until its closure. Wooden chairs used to surround the area around the pool and were always the hot commodity. Even the buildings had tubes of neon outlining them, although the neon hasn’t been used in many years. The Gallo family, who built Ligonier Beach, owned the pool from 1925 to 1998 when it was sold to Ray Graham. Graham owned it for 10 years before selling it to his daughter and son-in-law Sherry and Steve Kozar. Two local legends, Dean Martin and Perry Como, also got their start at Ligonier Beach. In fact, Martin was a towel boy who often sung with local bands who played at Ligonier Beach. Dancing is now long gone, but the stone band shell and ticket booth still remain, although they are surrounded by vegetation now. 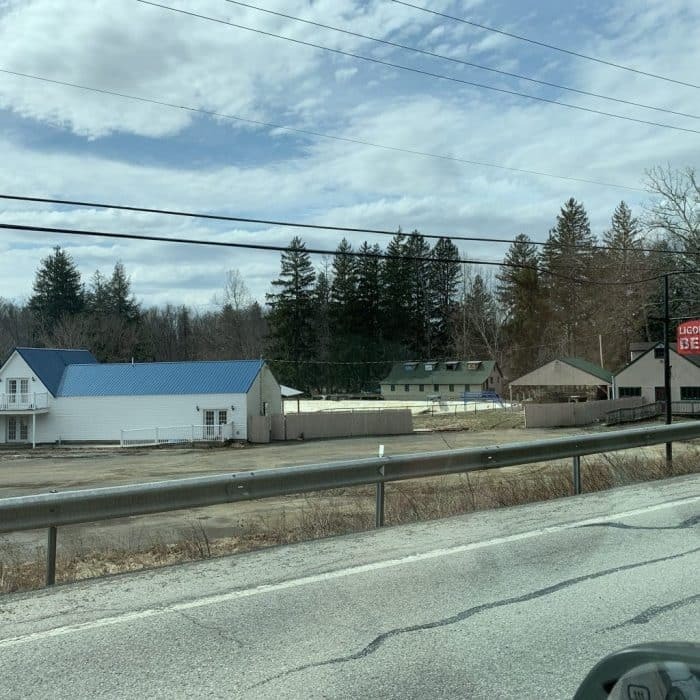 Ligonier Beach has seen a lot of changes over the years, including the creation and rerouting of the Lincoln Highway, rerouting of Loyalhanna Creek, and the change of name. However, it couldn’t escape time and Mother Nature. 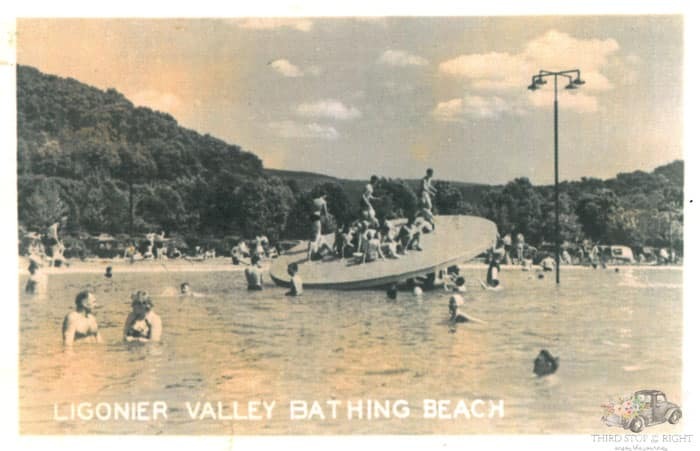 Since the 1970s, several Western Pennsylvania landmark pools have closed, including Oakford Park in Jeannette; Blue Spruce in Murrysville; Blue Dell in North Huntingdon; Rainbow Gardens in White Oak; and of course Kennywood’s Sunlite Pool. The demise of these pools was directly related to the rise of home swimming pools and the creation of water parks. Ligonier Beach remained popular and an example of one of just a few large outdoor pools left. 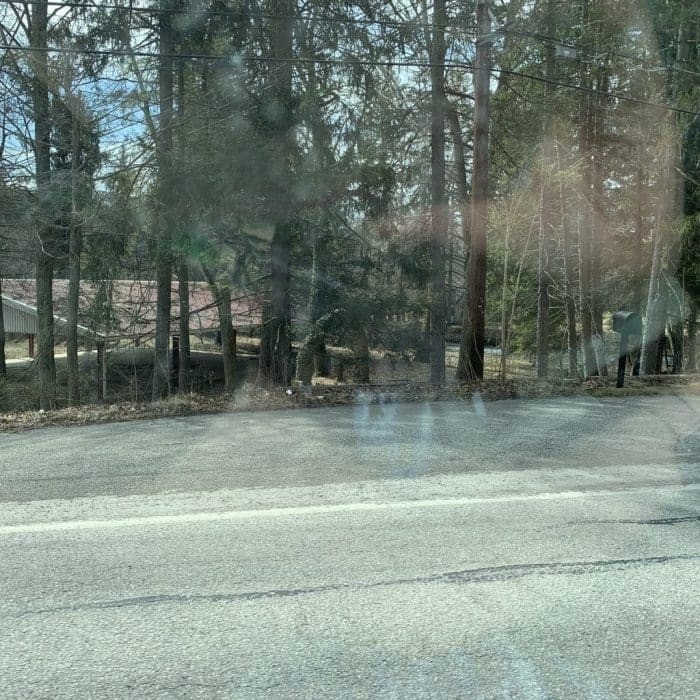 Problems started to surface, however, in 2016 when an arson fire started by a local 13-year-old broke out in the dining room. After the spring 2018 flooding it was determined that the pool would cost more to repair than to reopen — financially at least. If you look closely you can see the old band shell and pavilion. 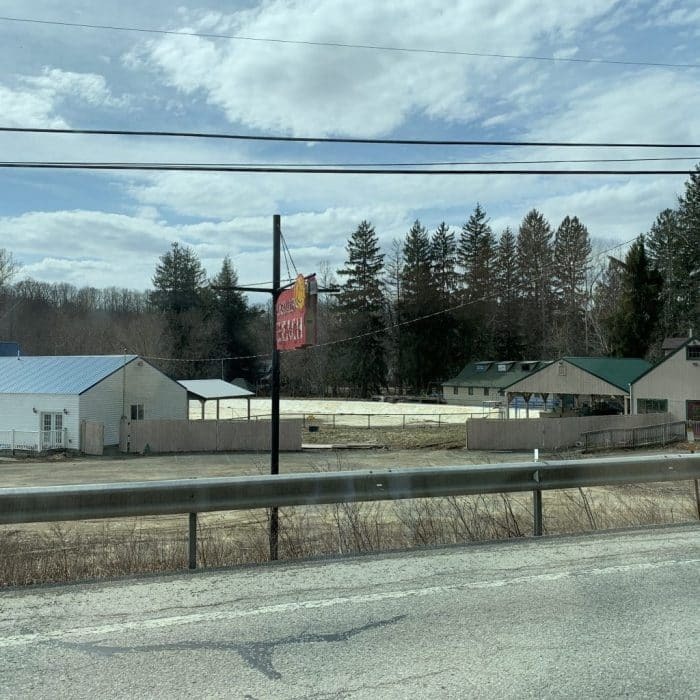 In a recent trip to Ligonier I decided to take a bit of detour and see the state of the pool. What was once a massive and beautiful pool is now just a shell. The jumping platforms are still visible as is the fountain mechanism. Inside the pool is filled with mud.